A plaque commemorates the site of the farm established by Governor Phillip in 1788. 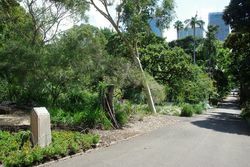 Governor Phillip originally intended to retain the land from Woolloomooloo Bay to Cockle Bay (Darling Harbour) as his own Domain. He allowed buildings on the western side of the Tank Stream but was able to keep the land on the eastern side for his own use. This land was cleared except for a few saplings and the Governor ordered the planting of ‘Nine acres in corn’ on the land which was later to become the first botanic garden in Australia. 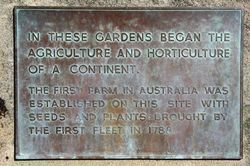 A commemorative plaque near the refreshment kiosk in the Sydney Botanic Gardens, on the site of Sydney's first farm, is to be unveiled by the Minister for Agriculture (Mr. Graham) on October 14 at 11 a.m. Mr. Graham will outline the history of this parent of all Australian farms. Farmer and Settler (Sydney,), 3 October 1952. In these gardens began agriculture and horticulture of a continent. The first farm in Australia was established on this site with seeds and plants brought by the First Fleet in 1788.